Last weekend we went on a fall hike in upstate New York. It was a gorgeous, sunny Fall day and the leaves were almost glowing and the state park was overflowing with people wanting to perhaps become a part of that beauty, just like the two of us. I promise I'll post on that very very soon.. but for now we have a pumpkin story. So, on the way, we stopped at a farm and picked up some yummy apples and a gorgeously bright orange pumpkin; a nice, cute sweet one. I have been waiting and waiting the whole month to make things pumpkin-y! I have all these ideas in my head for recipes. 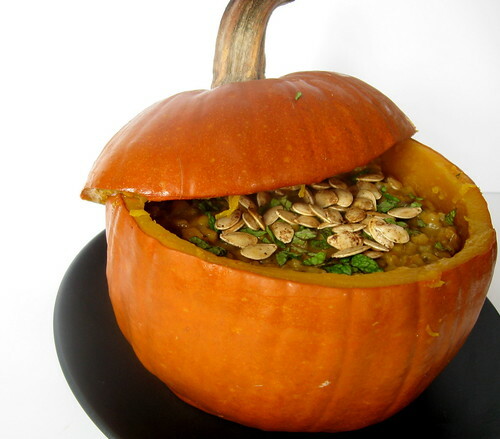 Anyway, I was really thrilled to find this fab looking pumpkin and decided to start off with risotto for Halloween. I think of risotto as a luxury not only because it is tricky to make and can go wrong so easily but also 'coz it takes a lot of patience and constant attention. As comforting as it can be, I consider it a special occasion dish and for this haunted day, I thought I would take a wee bit more time to ward off the ghosts. Ok! back to my pumpkin dish. 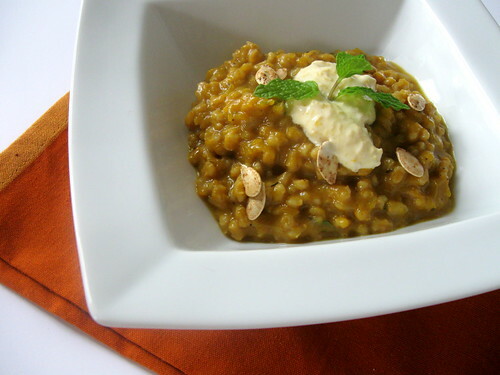 Risotto, as you know, is usually made with arborio rice, a short grain and very starchy strain of rice. But, I didn't use it. I made risotto with barley. Yep! I discovered barley in a soup sometime back and fallen in love with it ever since. It has the same creaminess when cooked slowly but it adds a wonderful earthy flavor to the dish. By the way, Renee over at Flamingo Musings has been hosting an awesome Halloween food event through this week. A bunch of foodies and food bloggies got together to make fun Halloween themed items. Check out what everyone made for the GreatHallowTweet at her site. 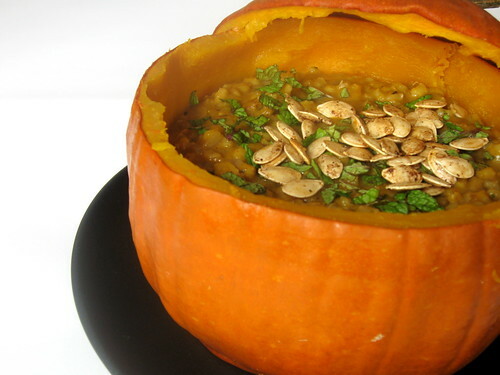 Cut the pumpkin, clean out the innards and place cut face down in a baking dish with a 1/4 inch of water. Bake in a 400 degree oven for 45 minutes until the insides are soft and cooked. Scoop out the cooked flesh and puree with the tiniest bit of milk to make a smooth puree. Saute the onions and garlic in butter until translucent. Add in the barley and toast for a couple of minutes. Season with salt, pepper, cumin, thyme and oregano. Add two cups of stock and cook until the liquid is almost absorbed. Stir in the pumpkin puree. Add the rest of the stock in half cup measures and stirring until it is fully absorbed. Slowly the barley will become creamy as the starch releases. When you are done with all the stock, remove from heat and stir in the sour cream. Serve immediately garnished with mint leaves and a drop of pumkiny-sour cream.